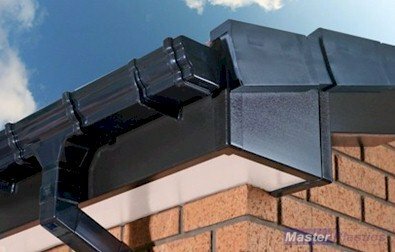 Full replacement black fascias and soffits no need for a backing timber use on a new build or when replacing rotten timber fascias, boards should be double nailed and may require a top fillet when used with heavy roof tiles. Soffits must be fully vented when using coloured fascias. buy online we will deliver to your door anywhere in the UK. Description: 150mm Black Ash Finish uPVC 16mm Full replacement 5m fascia to go on to timber joists No Backing Timber Required Colour: Black Ash Finish Dimension: 16mm x 150mm x 5m .. Description: 175mm Black Ash Finish UPVC 16mm Full replacement 5m fascia to go on to timber joists No Backing Timber Required Colour: Black Ash Finish Dimension: 16mm x 175mm x 5m .. Description: 200mm Black Ash Finish uPVC 16mm full replacement 5m fascia to go on to timber joists No Backing Timber Required Colour: Black Ash Finish Dimension: 16mm x 200mm x 5m .. Description: 225mm Black Ash Finish uPVC 16mm full replacement 5m fascia to go on to timber joists No Backing Timber Required Colour: Black Ash Finish Dimension: 17mm x 225mm x 5m .. Description: 250mm Black Ash Finish 9mm uPVC 5m replacement fascia to go on to timber joists No Backing Timber Required Colour: Black Ash Finish Dimension: 17mm x 250mm x 5m .. Description: 300mm Black Ash Finish uPVC 16mm full eplacement fascia to go on to timber joists No Backing Timber Required Colour: Black Ash Finish Dimension: 16mm x 300mm x 5m .. Description: 400mm Black Ash Finish uPVC 16mm full replacement 5m fascia board to go on to timber joists No Backing Timber Required Colour: Black Ash Finish Dimension: 16mm x 410mm x 5m Please note this is a double edged board it does not have a cut edge, if .. Description 200mm Black Ash 9mm uPVC 5m Vented Flatboard / Soffit. Produces continuous air flow. Vented Flat UPVC Plastic Soffit. Use as soffits under the eaves of your roof or as a general purpose flat board, use 30mm Pins to fix or an edge channel if you wish to.. Description 300mm Black Ash 9mm uPVC 5m Vented Flatboard / Soffit. Produces continuous air flow. Vented Flat UPVC Plastic Soffit. Use as soffits under the eaves of your roof or as a general purpose flat board, use 30mm Pins to fix or an edge channel if you wish t.. Description: Black Ash Internal Fascia Corner 500mm Double Ended Joint ..